Irony is not easily conveyed in the flatness of the page. 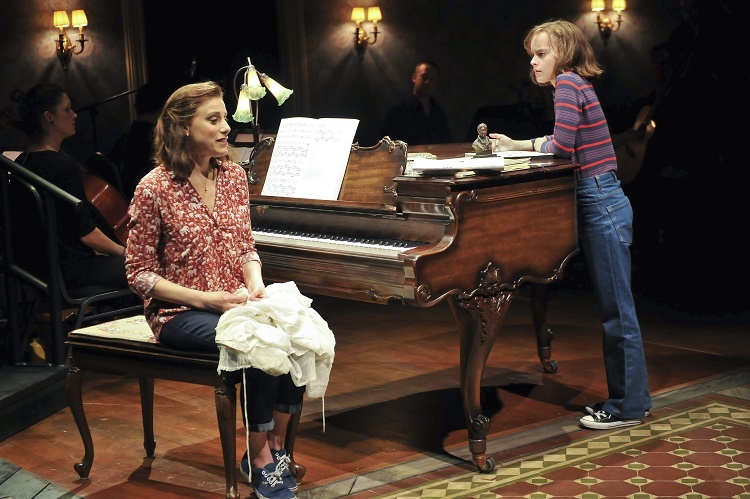 In Fun Home, a transfer from the Public to Broadway’s Circle in the Square, with cast pretty much intact, the irony is revealed on-stage. 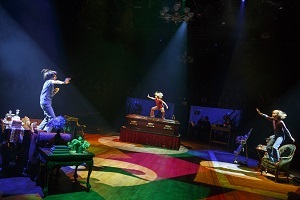 “Fun Home” is the name the Bechdels use for their family business, a funeral parlor their father inherited from his. There is irony also in this reference to the Bechdels grim home life. Mercurial and charismatic, Bruce (Michael Cerveris) holds his children and his wife, Helen (Judy Kuhn) enthrall. His daughter Alison’s (played by Sydney Lucas as a youngster) adulation of him is bound for disappointment. Bruce is a bully and fraud. Cerveris gets the nuances –and the narcicism- -in Bruce’s moods perfectly. Kuhn as his wife is appropriately defeated and downtrodden. The elder Alison (Beth Malone) narrates as she sketches. 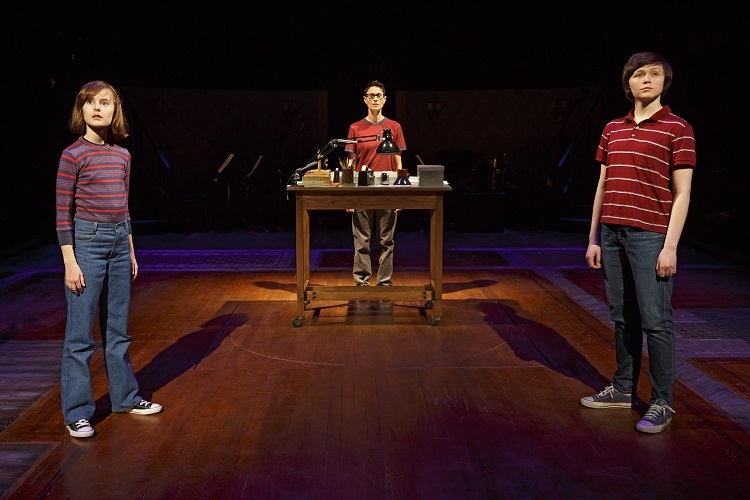 Fun Home is a memory play, or more precisely, a memory musical. Jeanine Tesori (music) and Lisa Kron (book and lyrics) adapted Alison Bechdel’s graphic novel of her reminiscences. Alison, as she tells the audience, is a lesbian cartoonist. Her drawings turn into the episodes of Fun Home. 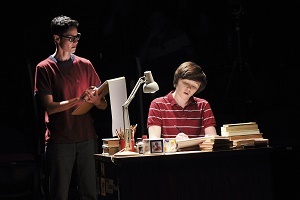 The things that shock the characters of Fun Home are not particularly dramatic or revelatory, and hence, the musical is low-key and emotionally held back. The cast are very fine, although the sotto voce score doesn’t fully showcase their talents. Each one of them does get one big number. It shines a light on their characters, and gives them a chance to belt one out. It also dispels a little of the gloom of the plot. That gloom is set up early on in the explication as Alison analyzes her life. A one-woman Greek chorus, she is reliving scenes and commenting on them at the same time in Fun Home. The three Alisons, Sydney Lucas, Beth Malone and Emily Skeggs. Photo (c) Joan Marcus. The excellent Emily Skeggs as Middle Alison discovers her homosexuality while in college. Her lover, Joan (Robetrta Colindrez) has a polymorphous androgenous sexiness that makes their attraction unsurprising. Rounding out the cast are the two Bechdel boys, John (Zell Steele Morrow) and Christian (Oscar Williams,) and Joel Perez in a variety roles. The stand-out among the children in the cast is Zell Steele Morrow, who is just precocious enough to be adorable. David Zinn’s sets and costumes are versatile, and work well. The staging is lovely, furnishings emerge from the floorboards, and the 7-piece orchestra occupies the archways at one end of the living room; the piano belongs to the Bechdels. Sam Gold directs. What better venue to celebrate the American artform than The Kennedy Center in Washington DC? 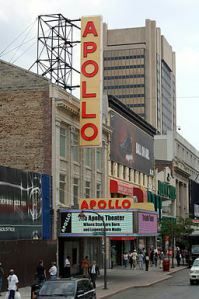 How about collaborating with New York’s Apollo Theatre, in the heart of Harlem, and present at both venues? The Apollo played a major role in the genesis of the Jazz genre, and they continue to showcase this musical art, its legacy, and its artists. MadGrin [CC BY 3.0 (http://creativecommons.org/licenses/by/3.0)%5D, via Wikimedia Commons Curating the two evenings in this collaborative event, Harlem Night/U Street Lights, is Jason Moran, Grammy- nominated pianist/composer and Kennedy Center Artistic Director for Jazz. Mr. Moran has brought together a wide array of jazz greats for the programs on May 9th in New York and May 10th in DC. 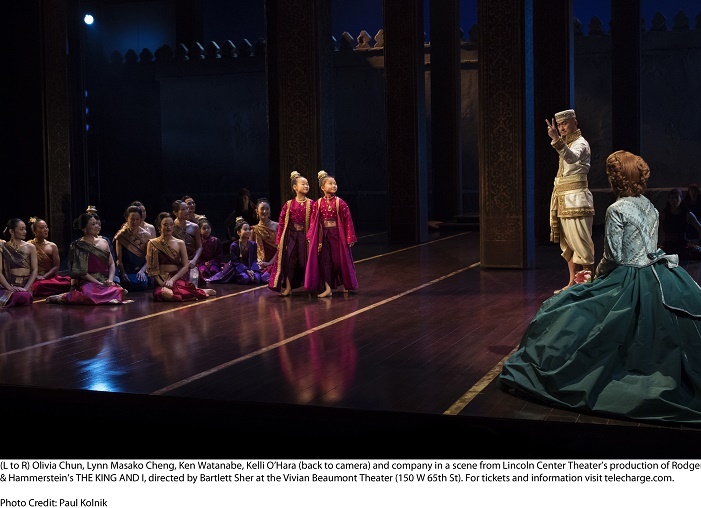 Photo by Paul Kolnik from a scene of “The King and I,” at the Beaumiont Theater, starring Kelli O’Hara and Ken Watanabe. There was a real-life Anna who taught in the court of Siam in the 1860s. Rodgers and Hammerstein tackled her story only after seeing the 1946 film version of Margaret Landon’s novel, Anna and the King of Siam, which they felt created cohesion from Landon’s fictional account. Landon, in her turn, had written her book based on Anna Leonowens’ own memoirs of her time as governess to the children of King Mongkut of Siam. The backstory, while interesting, does not begin to do justice to the musical Richard Rodgers and Oscar Hammerstein fashioned from it. The King and I soars with humanity. Kelli O’Hara and company, “Getting to Know You,” in a scene from “The King and I.” Photo by Paul Kolnik. Sometimes a production exceeds all expectations as The King and I, playing through January 3, 2016, does in so many ways. Lincoln Center Theater, following the success it had with Rodgers and Hammerstein’s South Pacific, has staged a wow-inspiring The King and I. Bartlett Sher’s direction is a tribute to the beauty of Rodgers and Hammerstein’s vision. The scenery, by Michael Yeargen, is splendid. It is oppulent, staying cleverly away from being gaudy, so that its elegance is of the understated variety. Props move, sometimes on their own, sometimes they are hand-carried. Scenes change seamlessly and fluidly. Ruthie Annn Miles and Kelli O’Hara in Lincoln Center’s production of Rodgers and Hammerstein’s”The King and I,” directed by Bartlett Sher. Photo by Paul Kolnik. As highly-anticipated as Kelli O’Hara’s appearance as Anna was, she rose well beyond. O’Hara is a skillful actress with a lovely operatic voice. 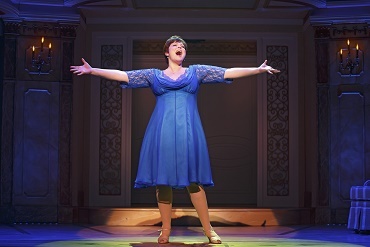 She is a major talent, who has been nominated for five Tonys. This year should see her sixth nomination, and a win! 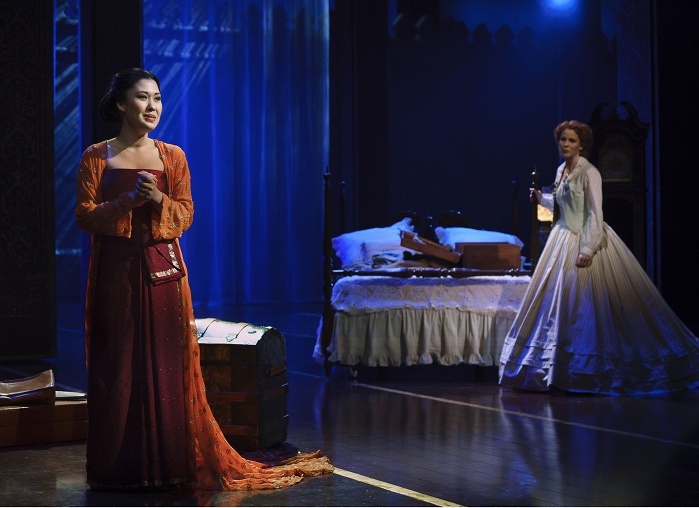 Standing out in the extremely capable ensemble are both Ruthie Ann Miles as Lady Thiang, the first wife in the King’s (Ken Watanabe) seraglio and Ashley Park as Tuptim, a present to the King from the King of Burma. 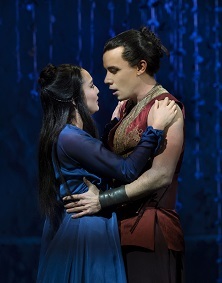 Ashley Park and Conrad Ricamora in Lincoln Center’s production of Rodgers and Hammerstein’s”The King and I,” directed by Bartlett Sher. Photo by Paul Kolnik. Park, like O’Hara, also has a splendid operatic voice, and her duets with Conrad Ricamura as her lover Lun Tha in “We Kiss in a Shadow” and “I Have Dreamed” are show-stopping. The easy friendship between Anna’s boy Louis (Jake Lucas) and the young Prince seems to foreshadow the coming of a more modern Siam. The wonderful staging includes a nearly 30 piece orchestra, led by the remarkable Ted Sperling. Costumes by Catherine Zuber are exquisite and stately. For more information about The King and I, please visit their webiste. Do you have a favorite wedding story? Was it a disaster? A shocker? Chip Zien as Maury and Tyne Daly as Judy Steinberg with Harriet Harris as Georgette and Michael X. Martin as George Howard. Photo by Joan Marcus. 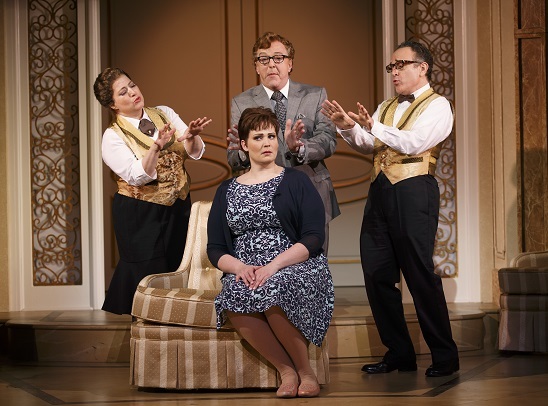 In It Shoulda Been You, at the Brooks Atkinson, the stress and distress happens during the Steinberg-Howard nuptials at the Saint George Hotel. As at any wedding, one minute you’re laughing, the next you have to grab a hanky. The bride’s older sister, Jenny (Lisa Howard) spearheaded the arrangements for a perfect day with the help of Albert (Edward Hibbert). wedding planner extraordinaire and his assistants, Mimsy (Anne L. Nathan) and Walt (Adam Heller.) Rebecca (Sierra Boggess) is marrying Brian (David Burtka) and everyone finds it a little unsettling. 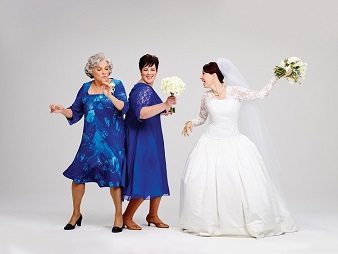 When Rebecca’s ex, Marty Kaufman (Josh Grisetti) shows up both the bride’s parents, Judy (Tyne Daly) and Maury Steinberg (Chip Zien) welcome the possibility that he will be able to stop the wedding. Brian’s parents, Georgette (Harriet Harris) and George Howard (Michael X. Martin) have plans of their own to take the nuptials off-track. The maid of honor, Annie Shepard (Montego Glover) and best man, Greg Madison (Nick Spangler) work just as hard to keep the plans for the big event from going awry. Director David Hyde Pierce knows his way around a farce. The woman run around frantically while their husbands, well at least the father of bride, indulgently stand-by. 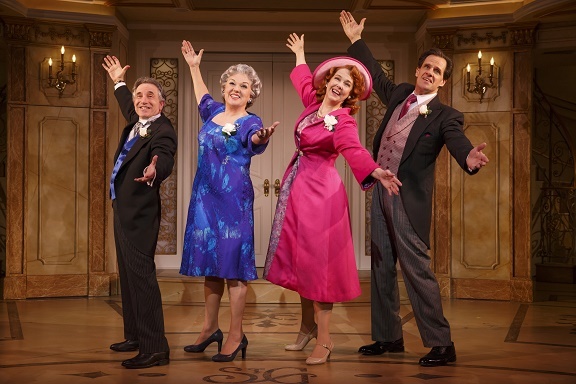 The acting is just-so, no over the toppers except for bawdy Aunt Sheila (Anne L. Nathan, again) and Uncle Morty (Adam Heller who also plays the mordant Walt) who deliver the zingers. Maury’s bons mots: “Your mother and I had words. … I didn’t get to use any of mine,” should be preserved on a throw pillow but they would lack Chip Zien’s inimitable delivery. In life as in comedy, timing is everything. Harriet Harris can really toss a line; Georgette’s passionate indifference is coolly conserved in her performance. Tyne Daly makes a wonderfully understated Jewish mother. Edward Hibbert’s Albert has a way of appearing and reappearing in perfect time and appropriate fanfare. In fact, the cast are all excellent, with Josh Grisetti in a flamboyant role a stand-out. Lisa Howard is superb in her starring role. Brian Hargrove’s book and lyrics are a truly funny execution of Barbara Anselmi’s concept. Anselmi’s tunes are euphonious. For more information, please visit the It Shoulda Been You website. It’s nice to see so many young people in the audience. This would not ordinarily be a lead for a review, but The Curious Incident of the Dog in the Night-Time, at the Barrymore, has already had a long run and plenty of notices. The British import came over with plenty of buzz, having won 7 Olivier on its home turf, including one for Best New Play. 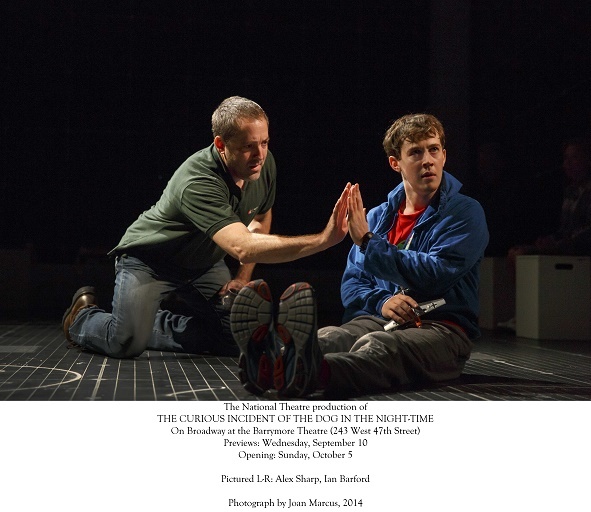 Playwright Simon Stephens adapted Mark Haddon’s best-selling mystery novel to the stage in such a brilliantly simple and direct fashion as to make The Curious Incident a moving and dynamic drama. 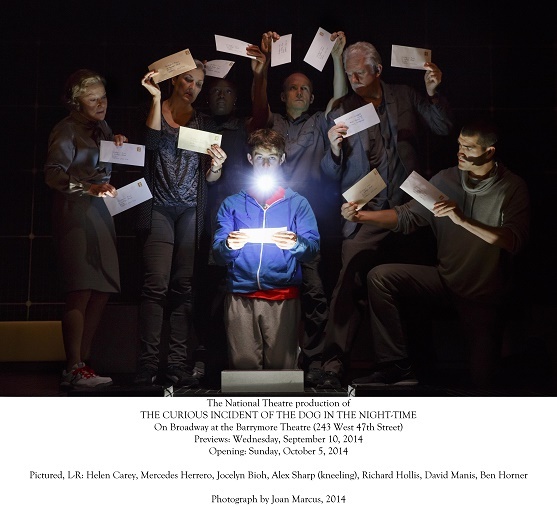 The Curious Incident earns the attention it garners from the youngsters and two floors below from the older crowd. The upper balcony seats, by the way, offer a great vantage for the panorama of this show. Its minimalist set, by Bunny Christie, of a few cubes and moveable furnishings, and diodes, courtesy of Paule Constable, lighting designer, and video designer Finn Ross, are tremendously effective. They aid in furthering the mood and the plot of The Curious Incident. There’s a lot going on this stage set, with people sometimes taking on the role of bed or computer. With such spectacular special effects, it’s hard to claim TheCurious Incident as low-key entertainment. Nonetheless, it is a mellow experience. The ensemble, under the direction of Marianne Elliott, are all terrific and The Curious Incident is a rivetting production. 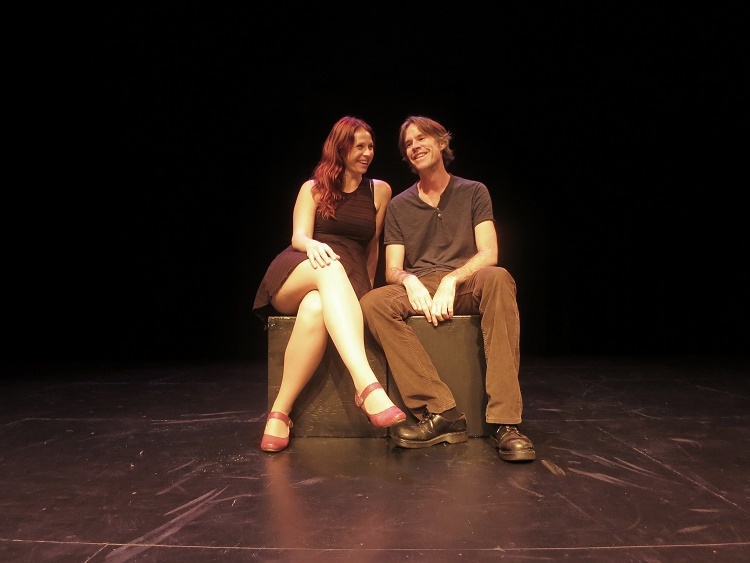 The couple’s relationship is constantly shifting which is part of the charm of Moonlight After Midnight, at The Kraine Theater through April 30th. You are constantly off balance, trying to figure out what’s real and what’s not. Mid-way through this short (fifty-five minutes) piece, the relationship turns on itself and off you go again, trying to figure out what’s happening. Even the ending is up in the air as so many relationships are. Dockery and Quesnelle are a real life couple which contributes to the natural feeling they project. Their interchanges are sharp and complete, even when they don’t quite make sense–or do they? Both are attractive people with honed talents especially Quesnelle’s voice– if she didn’t make it as an actress (which she will), she could hit it as a singer. 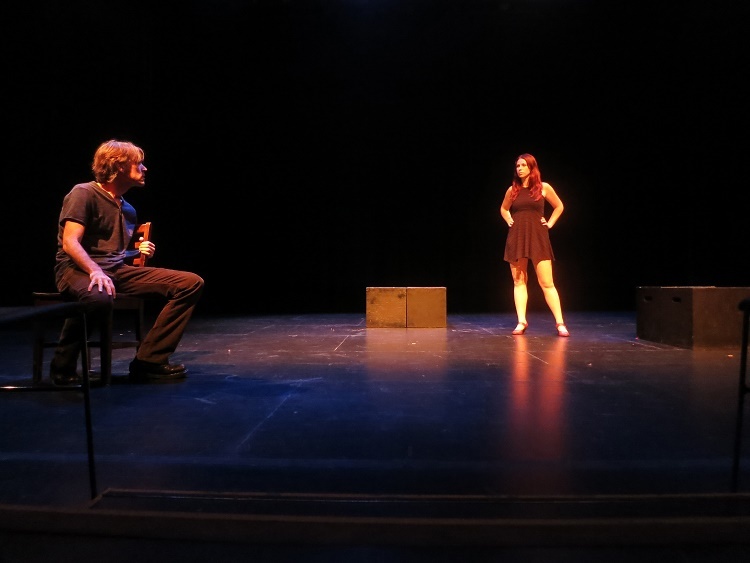 Moonlight After Midnight made its debut in Ottawa, Ontario in 2014 at the Ottowa Fringe Festival and then toured Canada before playing in London . This summer the show can be seen at theater festivals in Orlando, Cincinnati and Minneapolis. Dockery and Quesnelle come from New York so they love performing here but, as Dockery said after the bows, when your entire marketing budget is Facebook, you go where you can. If you’re anywhere in the areas they’ll be appearing, do yourself a favor and buy a ticket. The evening will live on in your mind as you try and sort out what’s real and what might not be. One-Night-Only Event, Monday, April 13 at 7pm, directed by Cosmin Chivu, The Temple Emanu-El Skirball Center and the Polish Cultural Institute New York present a New York debut staged reading of Our Class, Tadeusz Słobodzianek’s critically-acclaimed play. The star-studded cast includes Emmy, Oscar and Tony-winner Ellen Burstyn; Obie winner Alvin Epstein; Tony-nominee Boyd Gaines; Mamie Gummer (The Good Wife, Emily Owens, M.D. ); Randy Harrison (Queer as Folk); Grant Kretchik; Obie winner Brian Murray; John Pankow (Episodes, Mad About You); Obie winner Austin Pendleton. For tickets and information, visit emanuelskirballnyc.org. Going old school is not for these guys: Wednesday, April 15, 2015 / 8 pm Eastern/ 7 pm Central/ 4 pm Alaska/ 2 pm Hawaii Length: 90 minutes, four art groups, miles apart, at four different venues in Alaska, Hawaii, the Bronx and Manhattan will present a dynamic art project, live and in real time. United via video conferencing technology and despite their geographic separation, the artists will showcase their original collaboration that explores the intersection between traditional culture and contemporary artistic expressions. 47 Great Jones Street, New York, NY, and online via howlround.com. Bob Ader has been acting since he was a kid, hence the title of his one-man show, 50 + Years In The Business, on either April 19th at 3pm or April 20th at 7:30pm at PS87 Theatre, 160 West 78th St., NYC. Join Bob in celebrating his 50 + Years In The Business. Go online to ProjectRushmoreNYC.org for reservations. In honor of what would have been Piaf’s 100th birthday, RIOULT Dance NY presents a world premiere of STREET SINGER – Celebrating the Life of Edith Piaf.